Actor and director. Born in Taranto in 1951. He graduated in studies of theater at the university DAMS in Bologna and afterwards at École Internationale de Théâtre Jacques Lecoq in Paris. He also studied dramatic acrobatics and clown with Pierre Byland and later on he became his assistant. He starts his career as actor in the second half of the ‘70 and has worked with various companies like Pagliai-Gassman, Lello Arena, Parole & Cose of Rome, Donati & Olesen, Teatro Arsenale in Milan, Centre d’Art Dramatique d’Orleans and the Compagnie des Petites Heures of Paris. He plays for the major national theaters in Italy like Teatro di Genova, Teatro Due of Parma, Teatro Stabile dell’Aquila, Teatro Stabile del Veneto and in France for the Théâtre National de Chaillot and the Opera Comique of Paris. He works with some of the most important Italian and European directors like Benno Besson, Gigi Dall’Aglio, Jerzy Stuhr, Marco Sciaccaluga, Luca De Fusco, Marina Spreafico, Kuniaki Ida, Lluis Pasqual, Dan Jemmett and recently with Robert Sandoz at the Théâtre de Carouge in Geneva. 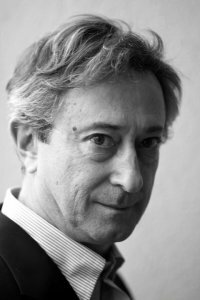 He directed various productions of the Compagnia Donati & Olesen like the show “Buonanotte Brivido” and the more recent “Radio Garage Rock” and of other companies like the Tangram of Vimercate, the CREST of Taranto and the Teatro Libero of Palermo staging texts of Ionesco, Beckett and Mamet. He worked as a teacher at the school “Fare Teatro” of Parma, theater school “A. G. Garrone” of Bologna, Scuola di Teatro Arsenale in Milan and in France at the Centre National des Arts du Cirque of Chalons-en-Champagne. In television he works in various productions directed by Ugo Gregoretti, Fosco Gasperi, Gerry Scotti and in cinema by Davide Ferrario and Michele Sordillo among others. Recently he directed Jacob Olesen in “Primo” adapted from “If This Is a Man” by Primo Levi, which has had a great success and is still touring all over Europe. In the last seasons he played in Così è (se vi pare) by L. Pirandello at the Pacta Salone in Milan.